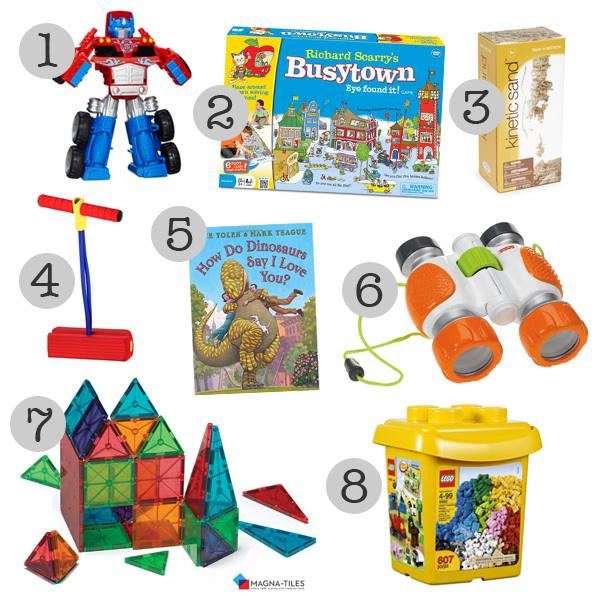 ‘Tis the season for holiday gift guides! I love reading these as much as I love researching and writing my own. And this year I have the joy of playing Santa to two little kiddos. First up, from Sam’s wish list. 1 | Optimus Prime | Sam is no exception when it comes to little boys’ attraction to Transformers. He has Bumblebee and Heat Wave, and he’s been asking for awhile to add Optimus Prime to his collection. These figures from Playskool hold up well to lots and lots of transforming. 2 | Richard Scarry Busy Town Game | We love Cars and Trucks and Things That Go (a.k.a. the Goldbug book), and I suspect this game will be a hit. It got great reviews and encourages more “I found it!” play. 3 | Kinetic Sand | I’ve heard this is even more fun than play-dough. And, I admit, that I’m pretty excited to play with it! 4 | Pogo Jumper | I’m all for anything that gets us up and moving during the cold winter months. And it can support up to 250lbs? I envision jump-offs in our future! 5 | How Do Dinosaurs Say I Love You? | This is one of our favorite series of books, and I look forward to adding this one to our shelf. 6 | Binoculars | Perfect stocking stuff for our little explorer. 7 | Magna-Tiles | Sam’s big Santa gift this year! Everyone I know who has this set says it is well worth the price tag. Sam’s preschool classroom even has one, and there is about a 90% chance that I will find him and his buddies playing with it when I arrive for pick-up. 8 | LEGOs | LEGOs get a ton of play in our house. We have several sets of DUPLOs, and Sam recently graduated to the “little tiny blocks.” He has to keep them in his room and out of Nora’s reach, which makes them an even more desirable toy. I love that these foster creativity in our little engineer!